The Samsung Galaxy S8+ is the larger version of the Galaxy S8, with a huge display and a diagonal of 6.2 inches. However, size isn't the only difference between Samsung's two flagship smartphones. Read on for our full review of the Samsung Galaxy S8+ as we take a look under the hood and dive into the nitty gritty. The Galaxy S8+ is now available in the US with Dual SIM and an Exynos chipset. All the details can be found in the release date and price section. The Galaxy S8+ will be available from April 21, and pre-order deals have already begun for around $850. It is available in three colors: Orchid Gray, Midnight Black and Arctic Silver. All major carriers in the US will offer the device, and pre-ordering is now available via the Samsung website. Some carriers are offering a free Gear VR with purchase, as well as other special discounts. Dual SIM capability will be available in some markets, but it doesn't appear to be available in the US. Samsung Korea has confirmed a variant of the S8+ with 6 GB of RAM and 128 GB of internal storage. All other specs will still be the same. For those who pre-order the device, the DeX station will be bundled with it. In the US, the Galaxy S8+ (SM-G955FD) is now available with Dual SIM and an Exynos processor. The extra card slot can be used for a second SIM card or to expand storage with a MicroSD card. The processor in this variant is an Exynos 8895, rather than the Snapdragon 835 that's usually sold in the US. The device is unlocked but will only work on GSM networks, meaning Sprint, Verizon and other CDMA carrier customers are out of luck. You can get the smartphone on eBay for $804.99. Note that it's region-locked to the Americas, but making a five minute phone call while out of the region will unlock it, so this shouldn't be limiting. Upon holding the Samsung Galaxy S8+ in my hand for the first time, it reminded me of the Samsung Galaxy Note 7. The symmetrical body, with its thin aluminum frame and curved glass looks great and feels incredible in-hand. Each element flows together seamlessly, even with the pre-production model we tested for this review. Granted, the Galaxy S8+ is a bit slippery, but it is a real luxury phone. Samsung has reduced the rear camera protrusion to a minimum, such that the glass in front of the camera is protected by a frame that is barely noticeable. Interestingly, it seems that Samsung has forfeited a fat-repellent layer on the back of the Galaxy S8+, as the back gets covered with fingerprint marks significantly faster than the front. There is an oleophobic layer on the display, which is more important than having one on the back, as this often disappears over time anyway. The Galaxy S series is finally getting a modern USB type-C port and this new socket sits below the mono speakers. The buttons on the side of the Galaxy S8+ are easy to reach despite the size of the device. Although the Galaxy S8+ is a big phone, it remains pleasantly flat and light, so it's not overly bulky either in-hand or in your trouser pocket. One of the most controversial aspects of the S8 and S8+ is the placement of the fingerprint scanner, which now finds itself located on the back of the device. Unlike its smaller counterpart, the sensor is far from intuitive on the S8+. While the home button stays within reach of the thumb, your first finger just can't reach the sensor next to the camera easily. We also noticed that the sensor of the Galaxy S8+, which is already inferior to the competition, is more slowly and isn't quite as reliable as the Huawei modules. As an alternative to the fingerprint scanner, you can of course unlock the Galaxy S8+ through the iris scanner but this option isn't as fast or as comfortable as the fingerprint scanner. You can also use facial recognition, but this is less secure. You get used to the lack of a home button really fast. Beneath the glass is a vibration motor at the exact spot where a home button would be, which provides some haptic feedback to your fingertip when you press on it. As such, the Galaxy S8+ imitates the function of an actual home button. The display of the Galaxy S8+ is not only huge on the paper: at 6.2 inches, it is significantly bigger than the Note 7, and surpasses most phablets on the market today. Thanks to the curved edges and the narrow frame, however, the size isn't really a problem. The resolution of the Super AMOLED panel, which has an aspect ratio of 18.5:9, is 2,960 x 1,440 pixels for both the S8 and the S8+ models. Samsung has included the WQHD+, which results in a pixel density of 530 ppi and thus you get a nice crisp appearance. If you want to use full resolution, you have to activate it in the system settings. The "+" of S8+ really shows its true colors when you look at the resolution through the aspect ratio. The Galaxy S8+ has a very elongated screen, which represents in its height more pixels than other smartphone with a similar resolution. The format is unusual at first, but is enormously practical especially for reading and surfing the Internet. Many websites are already designed - at least in mobile view - for a similar format, and there is simply more room for content on the screen. However, movies and games don't look as good on the Galaxy S8+. They are often in the format 16:9 or even 4:3, so the Galaxy S8+ displays thick black bars on either side of the image. An option for such games and films is to stretch the image so that it takes up the entire space, the only problem with this is that when you start the game up again, you have to go through the settings to set this up again each time, which can get a bit annoying. Some games, such as Sky Dancer, don't work well with the rounded corners and even cut out important buttons - this really shouldn't happen. Switching between 18.5:9 and 16:9 is a bit more fiddly on a Samsung device than on an LG one. The curved display edges, called Samsung Edge, are almost imperceptible when looking at the S8+ from the front. They add beauty without obscuring your view or being distracting. The usual Edge functionalities are still available on the Galaxy S8+, though they don't necessarily offer much added value in everyday life. When we tested this, the edges and the rounded corner display of the Galaxy S8+ have no issues; we didn't see any functions being unintentionally activated nor gestures not being recognized. Samsung has managed the edge gestures very well. The display is exceptionally vivid and bright, and even the smallest fonts are sharp. Here you don't really notice any difference between FHD+ and WQHD+, but you do at the lowest setting HD+, which takes away from the sharpness. The white of the display is cooler rather than warm, so lightly bluish. Samsung offers different display modes (AMOLED cinema, AMOLED photo, Easy) and also lets you play with the color balance settings. Night mode filters out the blue tones, which can protect your eyes. The Galaxy S8+ also doesn't have much to hide in terms of viewing angle stability. The screen has mobile HDR technology, which provides an improved colorimetric space. With its size, narrow edges, great colors, high brightness and sharp resolution, Samsung has gone all out to give the Galaxy S8+ a really fantastic display. Smartphones are getting more and more power, which is crying out to be used. In a similar vein to Microsoft with Continuum on Windows 10 Mobile, Samsung has also gone down the route of making a smartphone that can also be used as a PC. DeX allows the Galaxy S8+ to be docked onto it and has an HDMI port and two USB ports for connecting other elements. The S8 home screen can thus be viewed on a separate monitor, which the user can interact with using a mouse and keyboard, just like on an actual PC. Apps can be used in multiple windows and web pages can be viewed in desktop mode. Samsung has focused a lot on Android's multi-window functions, so the app support for DeX should be quite neat. Contrary to Microsoft's Continuum, DeX isn't wireless and, in addition, the smartphone is no longer usable when running in desktop mode. With Microsoft, the touchscreen can even be used as a replacement for the keyboard and mouse. We haven't had a DeX dock yet in-house to test yet, so we'd rather not say too much at this point. Siri, Google Now, Amazon Alexa, HTC Sense Companion... digital assistants are all the rage. Samsung has introduced the Galaxy S8 with its own smart assistant: Bixby. Samsung is hoping to set the bar high because Bixby is expected to do nothing short of revolutionizing the way we use smartphones with voice commands. In the Galaxy S8+ demo, however, Bixby didn't quite work as well as we'd hoped and didn't always do what we asked. Samsung still has some time to work on this before the S8+ hits the shelves. At the moment, it's much too early to give an opinion on Bixby because the assistant and us as users still need to get to know each other a bit more. That being said, a problem still remains: initially, Bixby will speak only one language: Korean. Other languages will arrive later, the first on the list being English (expected to arrive in the Spring). In other words, it'll be a while before we can speak with Bixby in any language and it becomes a truly international tool. In addition, Samsung hasn't shared any SDK with developers yet so it can't be implemented in apps. Initially, Bixby will only work with 10 Samsung apps, if that. For now, we can only use maps, notifications, Bixby Vision and camera search. This isn't a lot and it doesn't have many advantages over the Google Wizard, which will also soon be available on the Galaxy S8 (September). So it seems to be rather pointless (for now) to have a physical button especially dedicated to Bixby. The Galaxy S8+ uses Android 7.0 Nougat and the Samsung interface: Experience UX. It's not as colorful as it used to be in older versions (called TouchWiz), one might even say it's modern and elegant. 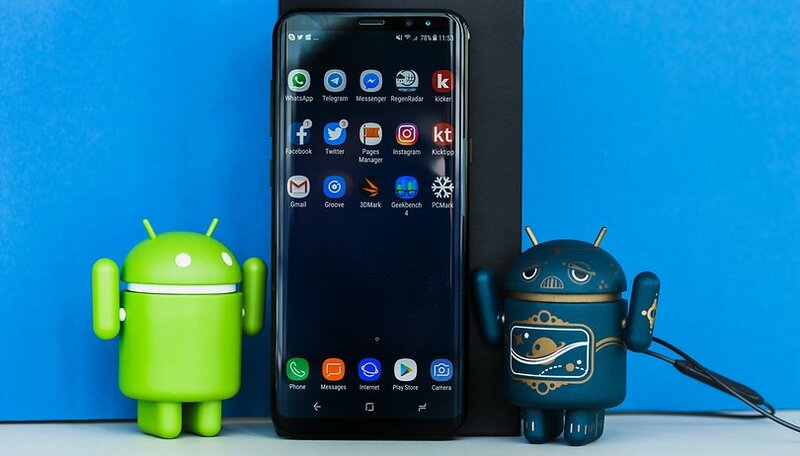 Samsung is very much oriented toward Android, but it hasn't foregone the opportunity to do its own tweaks and adaptations, notably in the notifications system configuration. The app icons aren't as subdued as those on stock Android or from other developers. The app drawer now appears with a gesture on the screen, like on the Pixel. This can be done in two directions: upwards and downwards. It's a shame that Samsung doesn't offer the possibility to view notifications with a swipe down gesture though. On the Galaxy S8+, this would be handy because the device is so large that it's a bit harder to access the notifications menu. Hopefully, Samsung will offer an update to get this feature. Another thing that Samsung should change: the Bixby button. The digital assistant is not particularly helpful at the moment, and this probably won't change in the immediate future. What's worse is that Bixby has its own button. Samsung should give the user the option to use this button for something else. Since the home button is no longer there, Samsung is now using virtual navigation buttons. However, Samsung hasn't changed the order of the buttons: the multitasking button is on the left, the home button is in the middle and the return button is on the right. Rest assured though, you can adjust these buttons in the system settings. Pressing where the virtual home button would normally appear will allow you to return to your home screen when you are in full screen mode. When we tested the Galaxy S8+, this worked without any problem, though it only happened very rarely (twice) that we actually needed to use it. Samsung still offers a lot of its own apps. Other manufacturers, such as HTC, have gone down a different route and don't offer their own apps, as Google already provides an app that is just as good, if not better. This would also be better for Samsung, because no one needs two gallery apps, two mail apps, two app stores, two fitness apps and so on, all of which have the same or very similar features. Samsung could also do away with its own browser, despite that it's a bit faster than Chrome for some applications, for example, in the Octane benchmark. We shouldn't forget to mention that there is very little bloatware on the Galaxy S8+: Microsoft apps (Word, Excel, Powerpoint, Onedrive and Skype) can actually be pretty useful on a daily basis. In the USA, Samsung has equipped the Galaxy S8+ with the latest Snapdragon 835 chip. In terms of graphics, which is no longer only relevant for gamers, the South Koreans also put in a Mali G71 GPU. According to Samsung, the performance here should be around 20 percent better than its predecessor. The chip is manufactured in a 10 nanometer grid, while its predecessor, the Snapdragon 820, was 14 nanometers. This change should lead to higher energy usage and make the chip more efficient. A high-end smartphone in 2017 needs decent storage space. The Galaxy S8+ comes with 64 GB of internal memory, it's unlikely that there'll be more variants as Samsung has reserved the 128 GB version for its Korean audience only. If you find yourself needing more memory, you can insert a memory card of up to 256 GB. The RAM will be 4 GB (Koreans will be privileged to 6 GB). When we tested the device, the Galaxy S8+ didn't show any signs of weakness, the device never slowed nor did it encounter any bumps. Everything runs fast, the home screen, apps, menus, websites and games - simply smooth sailing all the way. But we didn't expect any less from Samsung in 2017. We compared results from the usual benchmark tests against those of the competition - and there were quite a few surprises! Overall, the Galaxy S8+ ranked above the Huawei Mate 9 with its Kirin 960 processor. The graphics performance of the new GPU is better than the HiSilicon chip Huawei uses. The two PCMark tests prove to be interesting. For the internal memory reading and writing speed, the Galaxy S8+ falls far behind the Huawei Mate 9. The everyday use test, which simulates daily smartphone apps, also achieves better values ​​on the Huawei smartphone. At Geekbench, both the single and the multi-core results are quite close. Note: the values in this benchmark tests were acquired from the European counterpart of the Galaxy S8+, which has an Exynos 8895 chip, not the Snapdragon 835. In practice, these numbers don't necessarily mean much - after all, both smartphones run quickly and smoothly. The reference values ​​obtained in the benchmark tests (the Snapdragon 835 values were done with a special device from Qualcomm) should not be directly compared to those of the Galaxy S8+. These reference values ​​were not carried out on a device intended for marketing. All the values ​​obtained on this S8+ were calculated in full definition and in optimized mode, that is to say the mode that is activated by default. It's clear that there is no app that will cause the Samsung Galaxy S8+ to buckle. Graphically challenging games, 4K videos, sprawling websites, this new smartphone can manage all of these without any problem. The powerful GPU also has no issue with the QHD+ resolution of the display, so you can switch it on without having to worry about the performance. The intriguing question though is whether this high level of performance will still be around in a few months. With its intelligent file system, Huawei has developed a useful feature that should keep the new smartphones fast in the future. Samsung has promised that the Galaxy S8+ will follow in the same footsteps but whether this phone can stay as fast as it is today remains to be seen. The conversation quality of the Samsung Galaxy S8+ was exceptionally good in our tests. The participants on both ends of the line could hear and be heard perfectly and the ambient noise from the environment barely came through. Even in hands-free mode, this worked well and without great loss of quality, although the mono speaker at the bottom of the smartphone could be a little louder. This verdict on the loudspeaker also goes for music, videos and games. It's strange that Samsung, unlike many other manufacturers, intentionally chose to not use the phone's earpiece as a second loudspeaker for stereo sound. This doesn't work wonders, but in everyday life it's a small improvement. Samsung offers a lot more with its earphones that are from the Austrian company AKG, which belongs to Harman/Kardon and was bought by Samsung. This is a rather roundabout story, but ultimately, it doesn't really matter because the earbuds not only look good, but also produce a fantastic sound. An incredible amount of bass, distinctively clear pitch, and even at high volumes, there is no noise: that's something you don't get every day (or you could, with the S8+). The sound is even better when you switch the Galaxy S8+ to entertainment mode. The UHQ converter can also improve the sound quality. Together with the HTC U Ultra headphones, the Galaxy S8+'s AKG headset, which are worth $99, are the best available on the market. Another interesting thing is that the S8 supports Bluetooth 5.0, allowing you to connect two Bluetooth devices (headphones or speakers) to the phone at the same time. We tried it out, and it works great - allowing a user to turn the volume up or down on one device without affecting another. Plus, you can connect two Bluetooth speakers at the same time and really get the volume up high in your home. With the Galaxy S8+, Samsung hasn't followed the dual camera trend and has instead placed a single lens on its camera. The dual pixel technology that we know already from the Galaxy S7 is still at hand and ensures fast development. With 12 MP, the resolution is the same as its predecessor and the smaller Galaxy S8. The aperture of f / 1.7 is very large and allows a lot of light in. To take better quality photos, the Galaxy S8+ takes multiple photos at a time and combines them to produce the best possible rendering. This multi frame process has no impact on the speed of the camera, so the user wouldn't notice anything since all modifications are done in the background. In our test, the speed of the camera was the biggest highlight of this Galaxy S8+. We've yet to encounter a smartphone that's as fast at focusing, snapping and saving images. In low light, the Galaxy S8+ isn't any slower when it comes to photography. The dual pixel technology that Samsung used for the first time on the Galaxy S7 works very well on this device too. If you chose the 18.5:9 format, which is the option best adapted to the screen size, the camera offers excellent results. However, the resolution on the front camera is limited to 8 MP because Samsung uses a 4:3 format sensor in the S8+. Those who like taking selfies will particularly enjoy the 8 MP camera and its autofocus. The lack of autofocus on the Galaxy S7 had been the subject of much criticism. Samsung has been strictly against an LED flash on the front and on any other gadget of the sort because it's just not really necessary. The front camera doesn't make videos in 4K but it will in QHD with a definition of 1440 x 2560 pixels. The video stabilization worked well in our test on the Galaxy S8+ and provided more stable images. According to our photography expert, Stefan Moellenhoff, in low light situations, for most non high-end cameras, the colors typically tend to be a little too warm. There is also have a slight increase in noise and a loss of sharpness of detail depending on how dark the scene is. The Galaxy S8's image processing algorithms generally do a good job keeping a fair balance between noise and maintaining detail/color. The winning point of the Galaxy S8 compared to its competitors is its software. The app is incredibly fast for taking photos and the autofocus usually does a good job - even in low light. In addition, Pro mode, which is already very well designed, allows the user to manually adjust settings such as white balance, shutter speed and ISO sensitivity. Although it's a pity that the ISO sensitivity is limited to 800 - in low light conditions, higher ISO speeds, for example, might be useful. In Auto mode, the Galaxy S8 uses four-digit ISO speeds. For most users, this won't matter much though. Finally, the Bokeh mode that artificially blurs the background to make it look like that photo taken with a camera with a large sensor, works surprisingly well. As Samsung's smartphone doesn't have a dual sensor to create any depth of image effects, it needs to take pictures with different exposures, forcing you to hold your pose for 2 or 3 seconds. The Galaxy S8+ doesn't only have a larger display, but it also has a better battery than its counterpart, the S8. It has 3500 mAh versus 3000 mAh, which is already a clear advantage. Wireless and fast charging are available to make things easier. That said, in our tests, the S8+ didn't prove to have a particularly good battery life. The smartphone could just about last a full day but two days would be a stretch. The ability to reduce the display resolution makes little difference in practice. However, screen brightness has a bigger influence, so you should keep this setting lower to squeeze some more running time out of the battery. It seems like Samsung preferred to focus on safety of the phone rather than venture towards greater autonomy. This is what we expected, and it's not bad either. It would have been nice to get something with a little more run time, but with fast charging, you can charge the battery fully in an hour and a half. In our PCMark benchmark test, the Samsung Galaxy S8+ (with the Exynos processor, not the Snapdragon) got a score of 8 hours 3 minutes with the brightness at 50 percent and in full definition, which isn't bad at all, it's actually somewhat average. After the Galaxy Note 7 debacle, Samsung had to prove itself, that much is obvious. It's also becoming apparent that Samsung is reaching its goal with the Galaxy S8+. The design is as elegant as it is successful, the quality of the build is perfect and although the format is unusual, it proves to be very handy for reading and browsing the Internet. It'll be hard to find a better screen on a smartphone and few cameras are better than this one. Even the performance is there and the icing on the cake is that it will have an up-to-date software version, and accessories such as DeX are on their way. Where there is light, there are also areas of shadow. For example, the position of the fingerprint reader is hard to reach on the Galaxy S8+. Of course, you can use the iris scanner or facial recognition, but this doesn't solve the problem. In addition, Samsung has put forward an AI assistant that isn't fully functional yet. More importantly for everyday life: battery life. We get the impression that Samsung did what it could to guarantee maximum safety and avoid exploding smartphones. This is understandable, but as customers, we are disappointed because we expected Samsung to put forward the best flagship possible. But the true verdict lies in our tests: neither the Galaxy S8 nor the S8+ offer this experience. This, and the huge price tag, has cost it its 5 stars. This Galaxy S8+ gets 4.5 stars because it's a very good smartphone, nothing more nothing less. One thing that hasn't been mentioned in the reviews (and I sure wish it had been) is that the S8+ is not compatible with all Bluetooth devices. Supposedly, only BT 5.0 or later...half of my BT devices no longer work with my phone. An edit on this...S8 and S8+ do not locate many of the bluetooth devices...that includes many car systems (like mine with BT 2A) and even a Galaxy S4 (with BT 4). Those it does connect with often do not stream properly making audio listening quite difficult. Tried in the shop, bezel too small. Too hard to hold horizontally without occasionally mistouch the screen. The curve also useless, keep mistouching screen when handling the phones. Well looking at photo quality in the iso ranges I'd be very disappointed 800 iso looks a complete mess hell my Z5 takes better photos at iso 3200 than this and this is samsungs newest camera? Not good. I like the amazing looking, hope that S9 will be full screen. heard it's going to be front and back screen? Everything except the aspect ratio of the display is good. Hate those pillar-box while watching videos. and very nice build quality. luckily​ there's still a trio of Pixels a Nokia flagship and Andy Rubin's Essential to look forward to. I'll never buy a phone at this level, but am looking forward to the dock/charger concept becoming standard down the price range. It's overdue. Once you get to 4gb (or even 2gb) of RAM there's no reason not to jack it into a big display, keyboard and mouse. My surprise is that lying down the phone could operate as a trackpad for the larger screen while standing up the small screen seems largely wasted. It is nice product overall, but it is not worth the upgrade if you already own S7. Same camera senzor, same amount of RAM. I will wait for next S generation or maybe we can wait to see what will Google offer this year with next gen Pixel. If i wasn't caught up in this note 7 debacle and now have the 7s edge HELLS YESSSSS this is a must have if anyone have a older model by all means this is the phone to get it has all the bells the right bells man I'm not happy at all but heck ill wait next time around !